Q. How does dog pee hurt trees? A.The bark is the protective layer for the tree. It protects the inner hydration system of the tree. Constant bombardment of urine on this protective layer eventually opens it up, exposing the tree to disease. Q. Can dog pee still kill the tree even if it isn't directly on the trunk? A. Yes, without a good protective layer of mulch that filters the urine – it will eventually seep down into the roots and damage the tree. It is very important to cycle the mulch as needed. Q. Why do I need the Dawg Tree Pee Guard? A. Because there is nothing else – this is the only product that was specifically made for this reason. It is a simple solution to a problem. It is landscape friendly and easy to use. It still allows the sunlight, wind, and rain to the base of the tree. It is tested and works and acknowledged by many in the horticulture community as a revolutionary device that substitutes for a fence. Q. You want me to touch this and flip it up after dogs pee on it? A. Yes - Normally, when landscaping is done, the following protective gear is worn: Protective Eyewear/Gloves/Hearing Protection. Look for the Dawg Tree Gloves coming soon. Q. Will this stunt my tree’s growth? A. No, the unit is outfitted with a weatherproof bungee cord that allows for growth and expansion. Q. Can I place a purchase order for a large quantity? A. 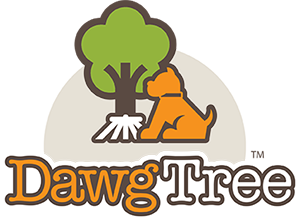 Yes, please send all inquires to guard@dawgtree.com You will be sent a Master Vendor Agreement and an Industrial Purchase Order form. Q. Why is this different than anything else? A. It is the first tree protection device that protects a tree 360 degrees, while allowing the sunlight, wind, rain, etc.. to the base that helps eliminate the possibility of attracting wood boring insects. It is user friendly, right out of the box and easy to set up. Q. Will this work for very big dogs? A. Yes, you may think that it won't work or that your dog is too big. It is all about where the dog plants his foot. The urine stream may get closer than a smaller dog. Please ensure that a layer of mulch is utilized to ensure filtration - replace mulch as needed. Test it and see.